Developer Charles Atwood and architect David M. Schwarz with Yale students designed pedestrian-friendly urban design projects in Las Vegas. 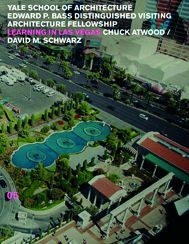 In context with the original 1968 Yale Las Vegas Studio, Atwood and Schwarz asked students to learn from other cities how to combat Las Vegas’s lack of street-oriented urbanism. Size: 9.2 x 7.2 in.